Growing up, Passover was dubbed the "holiday with bad desserts." It's not that passover desserts aren't good, but when you juxtapose Passover with Easter, it's kind of obvious what a kid would prefer. But lots of the baking "rules" that seemed limiting during Passover, well, they're kind of normal now. Gluten-free baking is BIG and it's not uncommon to find recipes that don't contain any flour or leavening agent in them at all. While most of my passover memories were of jelly rolls and thin chocolate cakes, they weren't all bad. There were always macaroons. Not to be confused with French macarons, macaroons are chewy coconut cookies that are usually dipped into melted chocolate. Ok, essentially they're like a fancy Mounds bar and damn they're good! This recipe changes the classic macaroon formula up a bit with a fresh flavor, lemon. There's lemon zest in the cookie and a generous scoop of lemon curd on top. 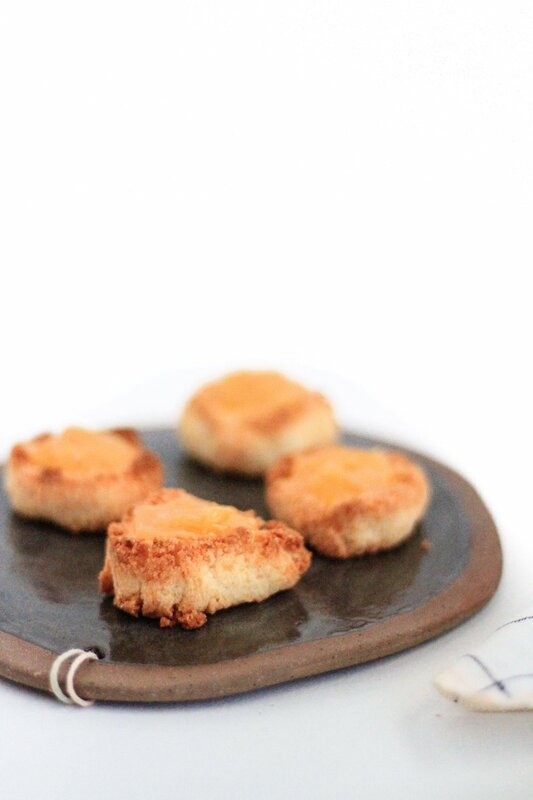 It's a perfect little spring cookie; crispy, tangy and sweet. Feel free to double or triple it if your gathering is going to be bigger. Oh, and before I forget! This is my 100th recipe on A Little Gathering. I'm tickled to see how many recipes I've created, and we're just getting started! Ok, back to business. Find this (100th) recipe below! Pre-heat your oven to 325 degrees Fahrenheit. Add shredded coconut, sugar, egg white, lemon zest and a pinch of salt to a food processor. Blend together until combined. When you can press the mixture together and it sticks, you're ready. Using a 1-inch ice cream scoop, scoop out each of the cookies. Using your hands, pack the mixture tightly into a ball. Using your thumb, squish a well that the curd will go into. Repeat until you have all your thumbprint macaroons ready for the oven. Bake the macaroons for ~20 minutes until slightly golden. Once cool, fill each of the wells with a bit of lemon curd. Enjoy!